Fabulous country-of-origin UK quad for. The Man With the Golden Gun. Starring Roger Moore in his second outing as Mr Bond. Bond quads always make for excellent investment pieces and this one is in fabulous, Near Mint, condition. Actual size of poster is 30 x 40 inches (31x 41 inches including linen-backing). Prior to linen-backing the poster was in excellent condition, a few pin-holes and minor wear on folds and light extra creases and extra folds. It has been expertly linen-backed with minor touch-up and is now Near Mint. For further details or information on backing or framing of this poster please see our website Orson & Welles. 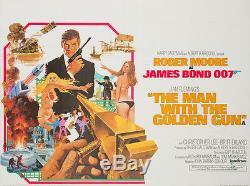 The item "Original The Man with the Golden Gun, UK Quad, Bond, Linen Film/Movie Poster" is in sale since Monday, October 5, 2015.